This theological Seminary was built in the early 1700's and had a farm attached. The farm is now under separate ownership. The property itself has been partially renovated (200m²) and the attached West Wing of 148m² requires renovation. The property offers surprisingly spacious accommodation in a quiet, tucked away position. Possible of purchasing a plot of 1200m2 by separate negotiation. AHIB-SP-001102 Nr Ger 50850 Equestrian property in Normandy with 31 acres and stabling with excellent hacking nearby. 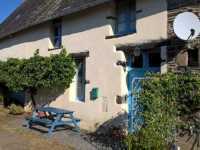 AHIN-SP-001092 Nr Mortain 50140 Detached Townhouse in Normandy within 2 minutes walk of a supermarket. The property offers spacious family accommodation with 3 bedrooms on the ground floor and 3 on the first floor. Garden. Basement. The house benefits from oil fired central heating and partial double glazing with electric shutters, and superb views over the Town. Viewing is highly recommended to appreciate the potential of this property.